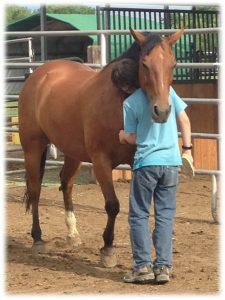 Equine Assisted Therapy (EAP) is a professional field in which horses are used as a tool for emotional growth and learning. EAP gives people the ability to have therapy outside the walls of the therapist office. Clients are more apt to talk about problems to an animal while they are performing an activity given to them by the therapist. Instead of years in counseling we are, in most cases, able to help in six months. DCTC treats the whole family because we feel what affects the client affects the entire family and therefore, helping the individual with mental health issues only alleviates part of the problem. 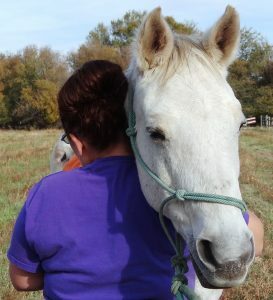 EAP is a collaborative effort between a licensed therapist, horse professional and the client. The focus of EAP is not riding or horsemanship, it involves activities done on the ground to help the client problem-solve, build confidence, learn to work as a team, build relationships, and improve verbal and non-verbal communication skills. This program has expanded to Health and Human service with child welfare. The fatherhood program reunites fathers with their estranged children, and the meth task force both in Montrose and Delta County spanning 4000 miles helping people get off of methamphetamine, alcohol, and other drugs. We have partnered with CASA to help kids get through the struggles of abuse, or neglect and children are referred through a court order because of delinquency, or trouble with the law. We are expanding and will be parterning with The Veteran Center to help Veterans with PTSD, depression, and readjustment to civilian life. Dream Catcher Therapy Center offers hope, acceptance, caring, and opportunities to heal, to improve, to learn, to love, to participate, and to understand themselves in a nurturing and non-threatening environment with the help of our powerful partner the horse. Our clients learn by participating in activities using the horse, then processing the feelings, behaviors, and patterns that result from that particular exercise. The setting is much less threatening and intimidating than that of a therapists office, especially for adolescents, who tend to respond better in a more natural situation. By adding the element of horses and their different personalities and sizes to the dynamics, new situations and experiences are constantly being created. Please visit the Equine Assisted Growth and Learning Association website for additional information on EAP. For More Information about Our Mental Health Programs, contact Kathy Hamm. It's going to be finish of mine day, except before ending I am reading this fantastic post to increase my experience.